Forklift Certification New York - Get Trained! As one of the largest cities in the world, New York City is home to a number of prospering industries like technical and scientific services, retail trade and food services, along with manufacturing. Each of these industries seek certified forklift drivers to enhance operations within facilities. For employers throughout the Big Apple, forklift certification in New York is required by OSHA. Does your company have the resources for New York forklift certification? If not, ForkliftCertification.com has the training you need to become – and remain – compliant. • Training Kit– one of our most popular forklift training courses in NYC, this covers all types of lifts, so you can focus your training accordingly. 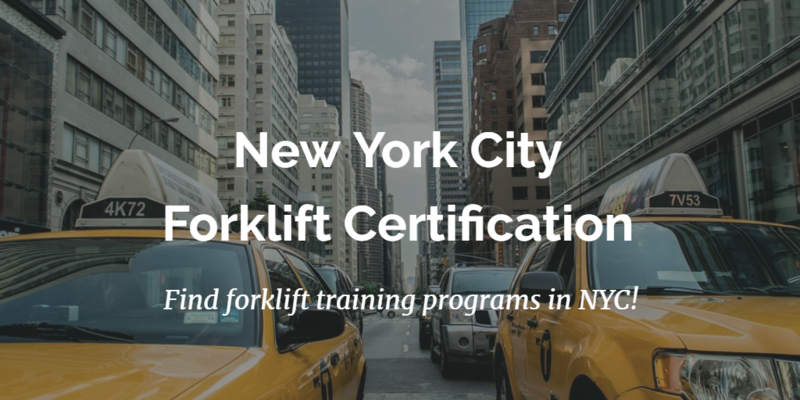 One of our most popular New York forklift certification programs! • Train a Trainer – forklift certification in NYC usually emphasizes lift operators. In this forklift training course, you’ll learn how to supplement your company’s OSHA training efforts. Perfect for those looking for advanced, well-paying forklift jobs in NYC, this package includes everything you need to become an in-house OSHA expert! New York forklift training doesn’t get any better than this! • Bundle Package – can’t decide between the Training Kit and Train a Trainer courses? Get them both for one great price with the Bundle Package! If want to optimize the value with forklift certification in New York, look no further than this outstanding combination. WHY DO I NEED A NEW YORK FORKLIFT CERTIFICATION? Forklift drivers must have knowledge of commonly-used practices and procedures when working in a warehouse or facility, and it’s the employer’s responsibility to ensure they have New York forklift certification. The practices they know must be specific to the particular type of forklift they are using, to be the safest at work. If you hire for forklift jobs in New York, you need forklift training. Sign up with us today at ForkliftCertification.com. How Does Forklift Training Affect Safety? Forklift training NYC is an integral part of being a forklift operator because it is the most effective way of preventing accidents. Without proper training, workers are much more vulnerable to accidents like tip-overs, collisions, crushing workers, and being hit by falling objects that can cause serious injuries and fatalities. Studies show that the most common denominator in the majority of forklift accidents is a lack of training. Not only can forklift certification training save lives, but it also protects businesses from legalities and OSHA fines. WHAT ARE OSHA’S REQUIREMENTS FOR FORKLIFT CERTIFICATION NYC? When it comes to forklift certification New York City, OSHA has set strict standards for helping to reduce the number of accidents that affect workplaces every year. According to OSHA, it is the employer’s duty to ensure all operators are competent at driving forklifts, following the completion of a forklift training course. Additionally, OSHA requires that training must include formal written instruction, practice training, and a skills evaluation. Training must also cover truck-related topics that include the controls and instrumentation of the forklift, pre-shift inspections, the condition of the truck, and more. It should also teach workplace-related topics, including how to maneuver around pedestrians and other hazardous situations, steering and stability, capacity limits, and more. Once workers complete the written online modules and tests, they must pass an in-person evaluation to receive their operator certification card. The forklift training NYC program from ForkliftCertification.com covers all of these requirements, and even includes three-year refresher training at no additional cost. FORKLIFT JOBS IN NEW YORK CITY – GET FORKLIFT CERTIFICATION IN NEW YORK TODAY! The City of New York is a top employer for those with a forklift certification NYC, as well as the Transportation Authority, United States Government and the State of New York—all of which need certified forklift operators. In addition, restaurants, warehouses and retailers like C&S Wholesale Grocers and Maines Paper & Food Services hire those who are certified. From John F. Kennedy International Airport to Nestle Waters, forklift jobs NYC are available in a wide array of sectors. • Material Handler with Dri Mark Products, Inc.
And don’t forget about the incredible amount of retail warehouses, and airports like the John F. Kennedy International Airport, LaGuardia Airport, and the Teterboro Airport. Maintaining the safety of New York City’s transportation centers is crucial for keeping its thriving tourism industry alive. Receiving New York City forklift training is easy and affordable with ForkliftCertification.com. We offer comprehensive online courses to learn the valuable skills needed to safely operate a forklift while complying with state and local agency guidelines. Upon completing the forklift training NYC, your employees receive OSHA-compliant forklift certification New York City to start a new career. Contact ForkliftCertification.com to complete your forklift certification training today! If you’re thinking that it sounds time consuming and expensive, think again! The online program from ForkliftCertification.com can be completed in as little as one hour, from any device with an internet connection. It’s easy, affordable and convenient. NYC traffic is crazy. Skip it altogether with online training you can do at home! ForkliftCertification.com offers new and experienced forklift operators online training to educate them in proper procedures and to refresh their knowledge as needed. It helps get workers into forklift jobs in New York, and current operators maintain their knowledge and skills. The New York City forklift training can be completed in about one hour on a smartphone, tablet, or laptop in the comfort of your home or while on your lunch break. Costing just under $300, the program is very affordable. Take a few minutes to create an account on the ForkliftCertification.com website, work through the online assignments, and voila! You will have instant access to your printable forklift certification NYC to present to employers. When you purchase initial forklift training NYC with us, you get three-year renewals for life! You’ll never have to buy another training course for your workplace ever again because you can use the training course over and over again to train new employees. Create an account and receive your forklift certification New York City today! As one of the largest cities in the world, New York City is home to a number of prospering industries like technical and scientific services, retail trade and food services, and manufacturing. Each of these industries seeks certified forklift drivers to enhance operations within facilities. Salaries for forklift operators in New York City are around $40,000 annually, which is slightly higher than the national average. Those who receive their forklift certification New York City will benefit from an in-demand career with ample growth opportunities. Take the next step – sign up with ForkliftCertification.com today and get your forklift certification in NYC! If you have any questions about our training classes, or if you need help getting started, call our OSHA forklift training experts at (888) 278-8896.